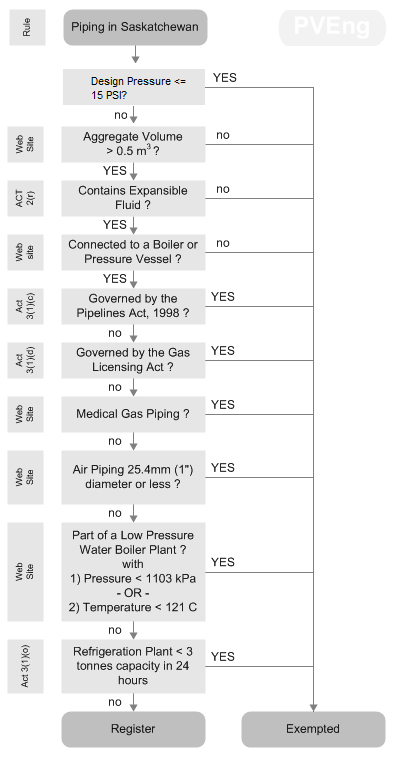 This flowchart is an approximate combination of information collected from the following sources: 1) The Boiler and Pressure Vessel Act, 1999 with 2006, 2010 and 2013 amendments. and Pressure Piping Design as discussed on the TSASK web site. The flow chart indicates which source provides which requirement. Where the requirement is listed in both the Act and the website, the Act reference is provided. piping systems that are not connected to, or used in connection with, a boiler or pressure vessel.